Teeth whitening is a simple, safe, oxygenating procedure used to lighten and brighten discolored teeth. Naturally yellow or darker teeth will benefit from whitening. Whitening is most effective when teeth have become discolored due to yellowing from age, tobacco, alcohol, coffee, tea, sodas, dark fruit, medications, chemically induced stains, accidents, trauma, and decay. 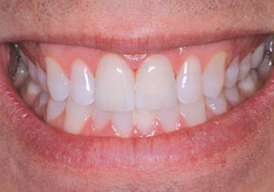 Whitening is not effective in whitening existing crowns or porcelain veneers. How is it done? How long does it take? We have two methods: in-office whitening and home whitening. The in-office whitening requires an initial visit to determine if you are a good candidate for this procedure. In-office whitening is accomplished through one office visit. The whitening solution is applied to the front surfaces of the teeth and activated with a safe, effective cool blue lamp. 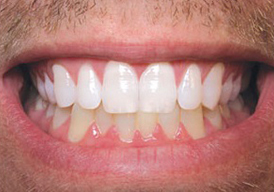 Most discolored teeth require only one office visit of about an hour and a maintenance bleaching tray with a special bleaching solution for home. At-home whitening requires an initial visit to determine if you are a good candidate for this procedure and for fitting of special custom made trays for your teeth. 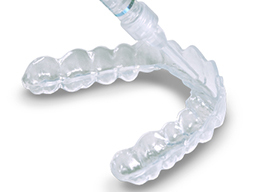 These thin, comfortable trays hold a special gel that usually whitens your teeth over a period of 7-10 days. With home whitening, you apply a mild whitening solution inside a custom-made tray that you wear for as little as 45 minutes a day. The home system can take 10-14 days for the best results.